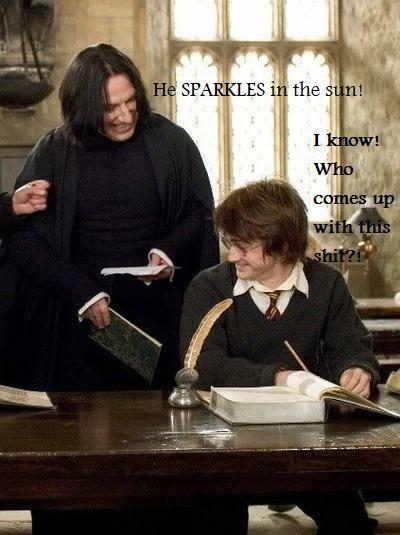 He SPARKES !!. . Wallpaper and background images in the Critical Analysis of Twilight club tagged: twilight funny anti. AHAHAHAHA! This sums it up for me. HAHAHAHAHAHA! Logic's Boggart is SMeyer. 'Logic's Boggart is SMeyer.' HAHAHA!!! Too true! We knew that her dreams were Twilight (since that's where it came from). I was wondering about the nightmare side of her mind. This picture is WIN. Just like Alan/Severus. Good job! This picture is amazing!!!Woah!! !And for one more time Harry and Severus rule!!!!!!!!! Logic's Boggart is SMeyer. LOL and yes that is true if boggarts existed and she stepped in front of one, I bet it would turn into a brain or something. Ha ha ha! I love this pic!